Carefully cut the peel from the oranges, taking care not to cut away too much of the pulp. Cut the oranges in quarters, pull out any seeds, and put it all in the bowl of a small 4 cup food processor. Whiz the oranges until they are completely pureed. Press the orange puree through a mesh sieve, using the back of a large spoon to squeeze as much of the juice through as possible. Some pulp will also get through, and that's what you want. Be sure to skim off the pulp that sticks to the underside of the sieve, that's good stuff! 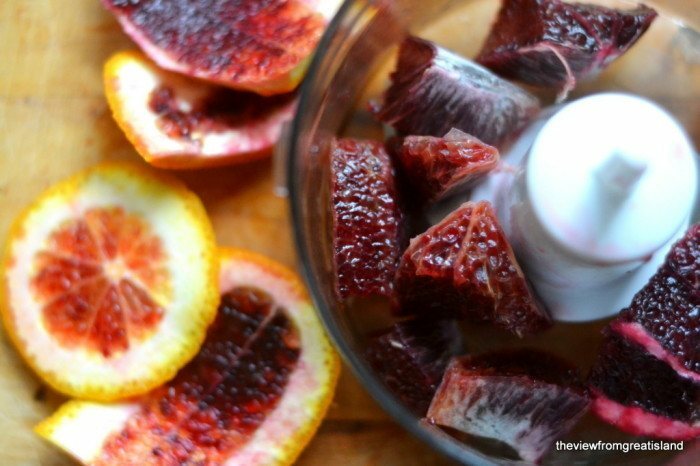 You will have approximately 1/2 cup or so of thick blood orange juice. Add about 1/3 cup of vinegar and stir well. Taste and add more vinegar if you like. Pour the vinegar into a jar or bottle with a tight fitting lid and keep in the refrigerator. Give it a shake before using, and use within the month.